I’m not really a dancer, but being privileged to be part of Autism Society Philippines’ (ASP) contingent in the DanceAbility Introductory and Teacher Orientation Workshops, held on 14-18 May 2013 at the Cultural Center of the Philippines (CCP), made me fully appreciate the beauty and art of dance, particularly one that is inclusive of everybody. 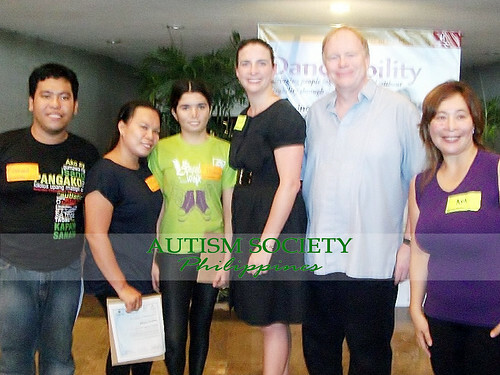 The DanceAbility seminars were part a project of the United States Department of State, the US Embassy in Manila, the CCP, and DanceAbility International, an organization promoting inclusive and accessible dance for all people, with and without disabilities. I, along with Teacher Ana of SpedDance Movement Therapy Services, Teacher Gina of ASP Laguna Chapter, and my fellow Thara, were among the workshops’ participants, who came from different regions in the Philippines. The participants ranged from teachers to dancers, and some of the dancers themselves have disabilities, specifically the Dancesport of TahanangWalangHagdanan, who had performed in Pilipinas Got Talent. Heading the workshops were Alito Alessi, DanceAbility founder and artistic director, and Karen Daly, DanceAbility teacher. Alito and Karen were chosen as Art Envoys of the State Department to share the culture of America to the world through dance. They have been doing the seminars as part of their missions in Indonesia, Mongolia, and here in the Philippines. During the workshops, Alito introduced us to the concepts of dance improvisation, specially crafted throughout the years to include people with and without disabilities. Karen, who is a wheelchair user herself, joined us and helped facilitate the activities as we practiced the concepts of inclusive dance that have been taught to us. I was amazed at the passion imparted on and exuded by everyone, particularly when we were doing improv dances during the five days we were at CCP. More than that, we were imparted with best practices on working with a diversity of individuals, regardless of what or who they are, whether they have a disability or they haven’t. As the end of the workshops neared, Alito and Karen challenged us to share what we have learned during those five days with our students, our fellows, and everyone in the community. After all, as what they have said, they have come to share their techniques to everyone, and as such, we have to do our part. Again, I’m no dancer. But now everybody’s going to be dancing.